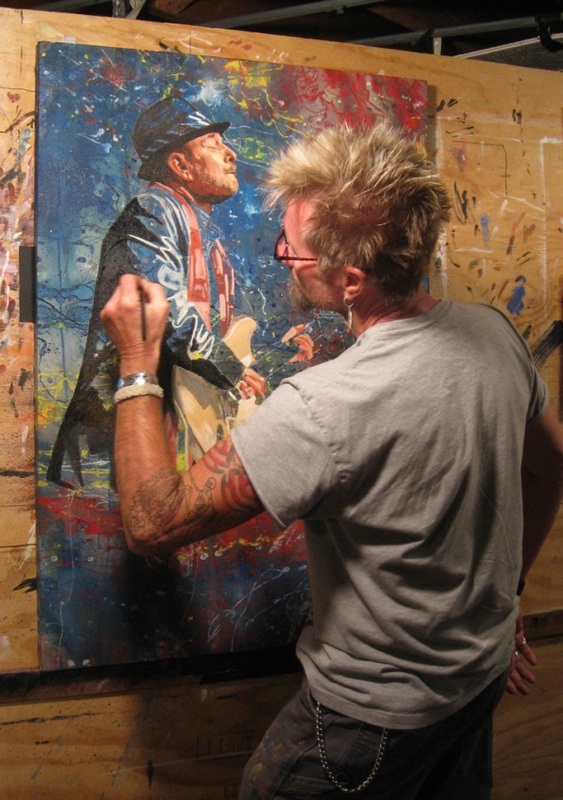 After our recent “Name the Ronnie Earl Painting” contest, I have been on the hunt for some fresh Ronnie video. Then two days ago… on Friday the 13th, Tab Benoit and Ronnie Earl played together for the first time and YouTube has the video to prove it! It was a great night at The Bull Run Restaurant with Tab Benoit rocking the house all night long and then inviting Ronnie Earl up on stage for a few tunes. This weeks photo is an emotion filled scene of Ronnie Earl…captured playing live. Mood set by Ronnie, Dave, Jimmy & Lorne! For more information, visit Ronnie Earl & The Broadcasters Official Website. Regular readers of The Guitar Buzz know that Ronnie Earl is one of the top 5 influences of my guitar playing style. I have written several posts about Ronnie and how his music resonates with me. Tonight, while surfing YouTube (my 2nd favorite pass-time), I came across this video by Tom Hazeltine, Ronnie’s road manager. I personally met Tom and Ronnie 2 years ago when I traveled to Boston to see Ronnie play at the Regent Theater. This audio, video and photographic collage are the perfect example of Ronnie Earl’s music…Enjoy! So who are GuitarDaddy’s “other 4 influential guitar players”? There you have it…no more secrets! My good friend Ronnie Earl is back out out on mini-tour playing clubs in the New England area. This is a fresh video of Ronnie and the gang playing a set at Chans, Woonsocket, RI on October 2, 2010. On this night, Ronnie invited Julie Melucci on stage to join him. The band: Ronnie Earl (guitar), Dave Limina (keyboards), Lorne Entress (drums), Jimmy Mouradian (bass) and Julie Melucci on lead guitar. Regular readers of TheGuitarBuzz.com know that I am a long time follower of Ronnie Earl’s music. Ronnie is a no frills, no flash, passionate and soulful blues guitarist…one of the best I have ever had the opportunity to hear. Ronnie Earl’s 20th release is available now from Stony Plain Records and “Spread the Love” qualifies as an all-instrumental religious experience in the blues. Ronnie has the ability of a pentecostal evangelist to reach deep inside someone’s soul and move them emotionally. The difference is that he does it without saying or singing a single word. 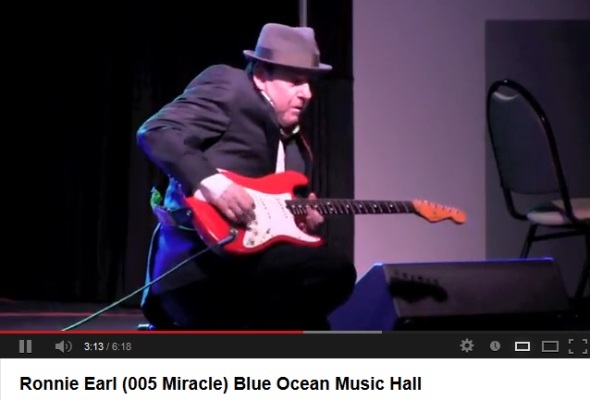 He does all of his “preaching” with the strings of his Stratocaster. 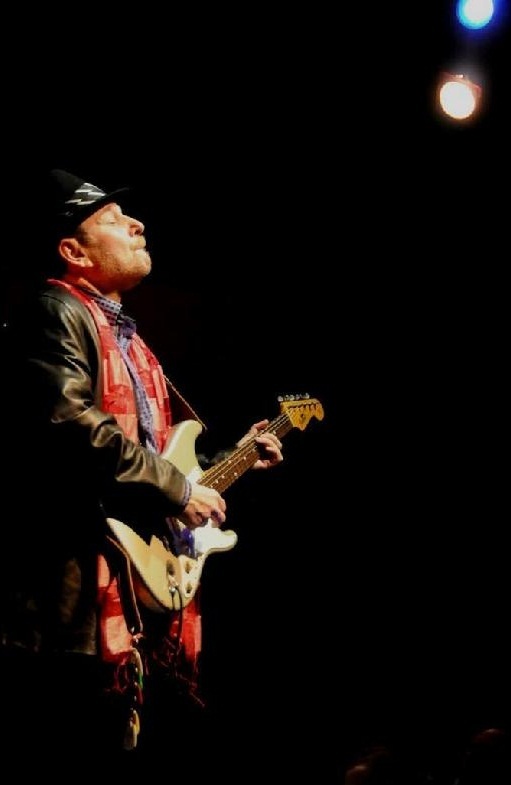 Ronnie resides in the Boston area and while he does not generally play venues that are more than a few hours from home, he still gets out and “Spreads The Love” by playing the message of the blues that’s ingrained into his soul. And we are so blessed that he does. Earl’s influences run parallel with many blues guitar aficionado’s — with the likes of Muddy Waters, Big Joe Turner and Otis Rush leading the way. “Spread the Love” includes a powerful step in the direction of Stevie Ray Vaughn, Albert Collins and Duane Allman. With that breadth of impression, “Spread the Love” is 14 tracks of instrumental blues that could double as a lifetime achievement award and a masterclass study — all in one. Ronnie’s band “The Broadcasters” include: Dave Limina (Piano, Hammond B3), Jim Mouradian (Bass), Lorne Entress (Drums) and are as tight as you could imagine. Their execution is flawless. It’s next to impossible to pick a favorite track. This is a 14-for-14 home run performance. 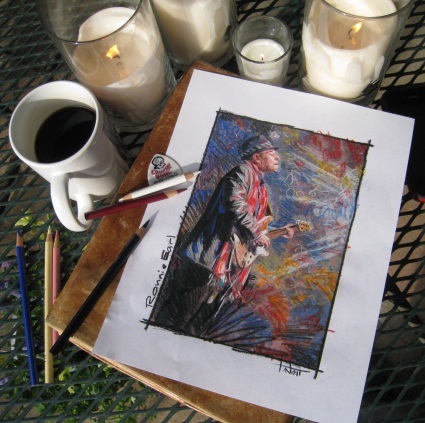 “Skyman” is Earl’s southern blues tribute to the memory of Duane Allman. “Backstroke” is Ronnie’s take on an Albert Collins cover that proves that the blues does not require over-playing or wasting notes. There is a just enough touch of jazzy blues on the cover of “Chitlin’s Con Carne” to make it fresh. “Blues for Donna” plays tribute to his loving wife and re-invents the phrase “slow blues” with eloquence. “Cristo Redentor” is the perfect example of a slow blues song where every note has a defined purpose and feeling. Remember, this is a masterclass study. Ronnie Earl is one of my hero’s. He has conquered alcohol addiction, cocaine abuse and mental depression all throughout his brilliant musical career. While he is clean and sober today (for nearly 20 years) the life of addiction was hard on Ronnie. Ronnie is known for writing and dedicating songs to people who are important to him. Some are by influence, many are in spirit and a select few are personal friends who stood by his side throughout the hardest times… like Tommy Hazeltine, Ronnie’s tour manager. I met Tommy a couple of years ago before Ronnie’s concert at the Regent Theater in Arlington, MA, after I snuck into the building during Ronnie’s sound check (I really did!). I explained to Tommy that I had traveled from Arizona to Boston to see Ronnie play live. Tommy made arrangements for me to meet Ronnie backstage — an encounter I will always remember. Bottom line, you can’t afford to miss this release! I have been a Ronnie Earl fan for a long, long time. I had the opportunity to meet him personally and hang out backstage before a concert a few years ago. He is a gracious man who understands the value of giving to others. For those who do not know, Ronnie is now in his mid-50s and has been part of the blues music scene for many years. 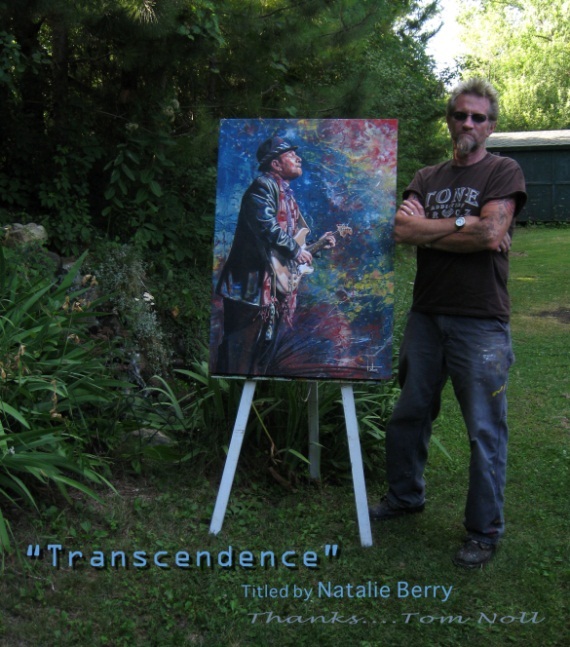 Deeply inspired by Muddy Waters, T-Bone Walker and Otis Rush, he started to play guitar in the 1970’s. He left the first major group he worked with in 1988, and moved on to build a solo career with his own band, The Broadcasters. Along the way, he went on to tour the world with Santana, sometimes playing for audiences of as many as 40,000 people. Recent years, however, found his career sidelined by a variety of health problems, which are thankfully, today, under control. When he says he’s feeling fine, he is, thanks, but the idea of touring again is as far from his mind as it can be. 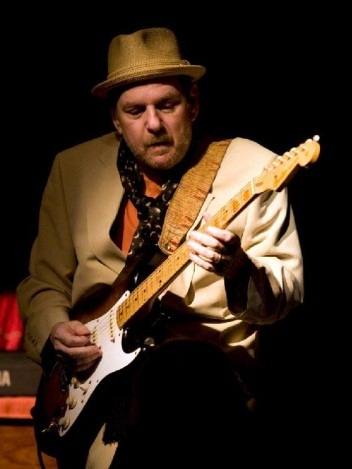 These days Ronnie is healthy, happily married and playing with the Broadcasters in the New England area and if you are fortunate to live in that area you still have a chance to see one of the finest blues guitar players — ever. Visit Ronnie’s web site and follow his tour schedule by CLICKING HERE. The video below was posted a few days ago on YouTube (thank you ZigBlues) from a concert Ronnie played last month at The Narrows in Fall River, MA. On that night, Ronnie invited 16 year old guitarist Julie Melucci to join him on stage for a blues jam she will never forget! My favorite part of the video comes at 5:30 when Ronnie motions that he is going to step back and let Julie showcase her chops! 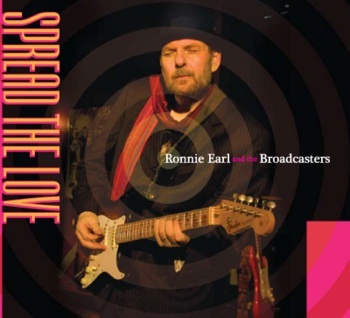 By the way, a new recording from the Ronnie Earl and the Broadcasters titled: “Spread the Love” is set to be released on August 24th, 2010 by Stoney Plains Records. Stay tuned to TheGuitarBuzz.com for more details and a full review as soon as the CD becomes available. While the world is waiting for the Super Bowl to begin, I am perusing YouTube… watching classic videos from my guitar heroes. What a great way to pass the time! Most of you know that I am a huge fan of Ronnie Earl and when I came across this rare clip of his impromptu rendition of “Amazing Grace” (played while sitting on the church steps) it seemed appropriate to share with the readers of the BUZZ on this beautiful Sunday afternoon.